ARLINGTON, Va. — The majority of pickups recently put through the passenger-side small overlap front test struggled to maintain their structure, but two trucks — the Ford F-150 and the Nissan Titan — earn a good rating. The F-150 and the Titan join the Ram 1500, whose good rating in the test was released late last year. The Honda Ridgeline, which earns an acceptable rating in the passenger-side test, is the only pickup so far to qualify for the 2019 Top Safety Pick award, thanks to available good-rated headlights, which the other models all lack, and available superior-rated front crash prevention. The Ridgeline qualifies for the award only when equipped with those features. The Toyota Tacoma also earns an acceptable rating in the passenger-side test, but it falls short of an award because of headlights. In total, IIHS has rated 11 crew cab pickups in the passenger-side test — four small and seven large. The Toyota Tundra, a large pickup, earns the only poor rating, while five of the trucks rate marginal. 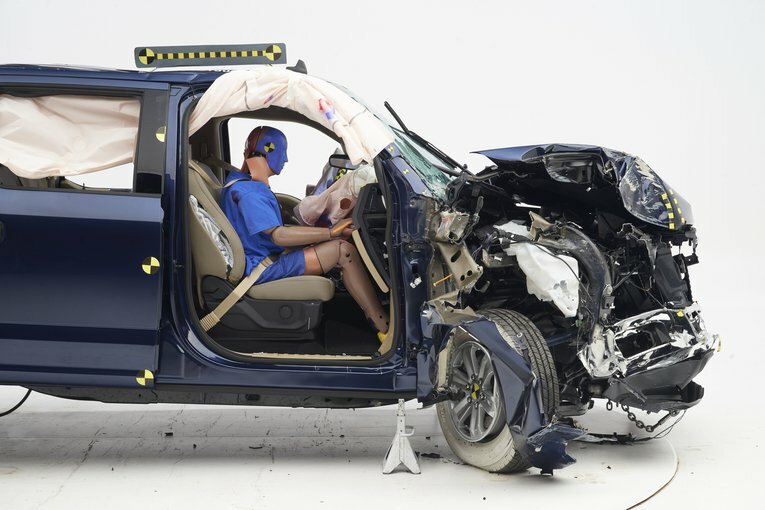 "We commend Ford, Nissan and Ram for providing state-of-the-art crash protection for both drivers and front passengers of their large pickup models," says David Zuby, IIHS chief research officer. "As a group, however, the pickup class still has a lot of work to do." A small overlap crash occurs when just the front corner of the vehicle strikes another vehicle or an object such as a tree or utility pole. 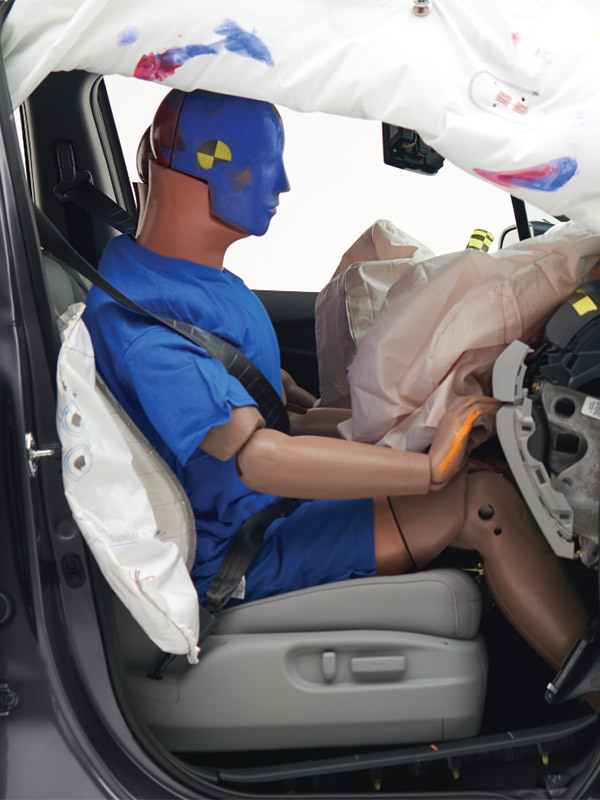 IIHS began rating vehicles for protection in a driver-side small overlap front crash in 2012. In 2017, the Institute launched the passenger-side test to make sure occupants on both sides of the vehicle get equal protection. Pickups took longer than other vehicle categories to meet the Institute's challenge for driver-side small overlap protection, so it's no surprise that they are lagging a bit in the newer passenger-side evaluation. Today most pickups earn a good rating in the driver-side test. A front crash test represents a much more severe crash for a pickup than for smaller vehicles because the severity of a crash into a fixed barrier depends on the weight of the vehicle. The structure of the Honda Ridgeline held up well, while the Toyota Tundra had severe intrusion into the passenger space. The Tundra, in contrast, was seriously compromised by intruding structure. Maximum intrusion, also at the rightmost part of the toepan, measured 15 inches. There was also intrusion of more than a foot at the lower door hinge pillar. 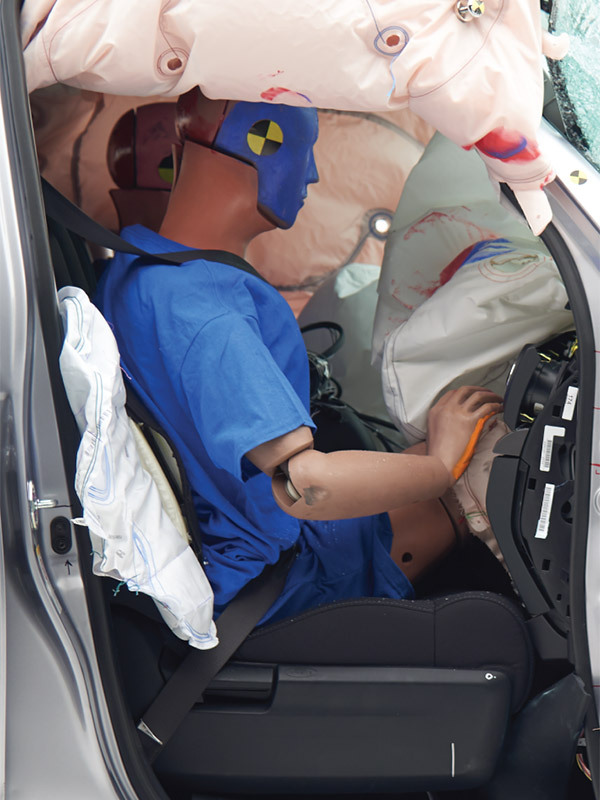 The passenger dummy's head hit the grab handle attached to the A-pillar as the A-pillar intruded into the passenger's space. Measures taken from the dummy indicate that injuries to the right lower leg would be likely in a crash of this severity, and injuries to the right hip would be possible. The Tundra and the Nissan Frontier, which earns a marginal rating in the passenger-side test, are still struggling with the driver-side small overlap test. Both earn a marginal rating for driver-side protection. These trucks have the oldest designs in the test group. The Frontier's basic structure dates back to the 2005 model year, while the Tundra's is from 2007.